Tag - PlayStation Vita | Squackle.com! The Funniest Site on the Net! Telepathy, telekinesis and psychometry are pretty legit. Pryokinesis, cyrokinesis and healing are stretching things a bit but are acceptable. Though, I absolutely refuse to believe that super-strength and teleportation are proper manifestations of psychic force. Super-strength is the supernatural ability to exceed the physical limits of natural strength and thus is regulated to the body and not the mind where psychic abilities dwell. Teleportation is the ability to instantaneously move from place to place without any of the travel in between and is centered on spatial manipulation rather than the power of the mind. Psychic sympathizers would have you believe that just because they could involve a conscious effort that they must be placed under the oppressive umbrella of a psychic power. Nay! Rise up against these ability oppressors and embrace superpower diversity! 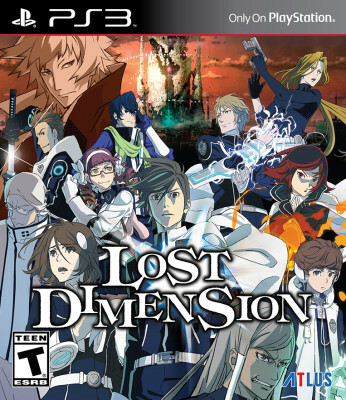 Developed by Lancarse, and published by ATLUS, Lost Dimension is a Strategy Role-Playing game (SRPG) that borrows various ideas to give you a game about a group of psychics climbing an enigmatic tower. Shades of video games like Dangan Ronpa, Valkyria Chronicles and Persona, as well as other media like A Certain Magical Index (To Aru Majutsu no Index), Tokyo ESP, Arkham Horror and more are used to make the psychic SRPG soup that is this game. 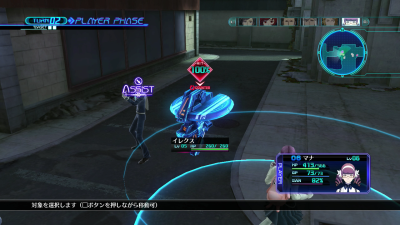 Though, what really sets Lost Dimension apart is a traitor mechanic that has you offing a member of your party at each floor. It all combines to make quite the familiar product with a diversifying gimmick that captures the attention. 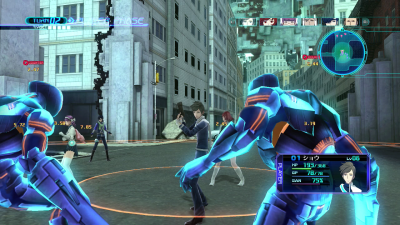 At first glance Lost Dimension looks like a rather by the numbers SRPG. A simple romp where you’ll move characters across a map and eventually level your way to the top of the tower, but with the borrowing Lost Dimension does from other games it proves to play better than it looks. Much like Valkryia Chronicles, the movement is freeform instead of grid based. This usually translates to the characters having a full circle of movement and is especially useful when characters have movement abilities, like teleportation, that lets them completely bypass some obstacles on the map. Borrowing an aspect from Fire Emblem, the game’s Assist attacks reward good positioning by giving inactive units a chance to do a follow-up attack if they are close by. While this all usually plays out rather fluidly, the occasional mid-attack load screen does disrupt the flow. Though despite the minor inconvenience, both of these aspects give the game charm where there otherwise wouldn’t be any. The story won’t get any awards but fits as an acceptable excuse for the game to play out. Thrown right into the story with very little frame of reference, you find yourself as confused as Sho who just so happens to have amnesia like the rest of his group (and every other protagonist from a JRPG). The group tasked with 13 days to climb a mysterious tower and stop a dangerous terrorist from ending the world, the most aptly named final boss in video game history, The End, thrust them into a malicious game where their trust will be tested and their allies will be killed by their own hands. same company that brought you LA Gears. In terms of strategy, it never really evolves past taking advantage of the Assist attacks mechanic to add on extra damage. On the other hand, I did find that the difficulty increased at a fair and steady rate. In particular, the Berserk mechanic grew increasingly difficult to control and proved to be quite the double-edged sword. Much like in Arkham Horror, each character is outfitted with a Sanity meter that decreases with every special move and attack they receive, and unlike it, once depleted causes the character to go Berserk and out of control. Now other than the obvious detriment of having a character go out of control and attack both ally and foe alike, the mechanic can also turn the character into quite the heavy hitter. Time and again, I’d send a character far and away from his allies and deep into enemy territory to purposefully deplete their sanity and then immediately hit with another attack for about 2x or 3x the usual rate. Of course, if I didn’t position them wisely, my characters would be given the same treatment. Though, it was a shame that you couldn’t use the mechanic to figure out the traitor. See those bright blue letters over the character’s face? They mean you’re playing the game right. Every floor up the tower, Lost Dimension tasks you with voting for who the traitor is among your ranks and “erasing” them from the party. If the traitor is found, they’ll be eliminated. If not, an innocent teammate will be killed instead and the traitor will then betray you some time later. 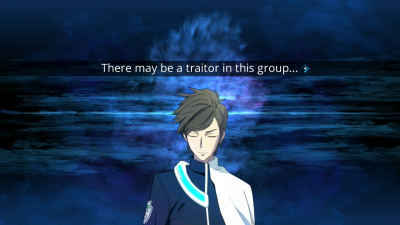 Usually there are three suspects every floor with a single traitor between them that you will fish out by way of an after-battle cutscene where the main character, Sho, will read the thoughts of his teammates. Then through a mixture of careful positioning and a Vision Point system that allows Sho to dive into the minds of his teammates to discover their true intention, the traitor can be exposed. Once armed with that knowledge, Sho is able to sway his teammates by way of simple dialogue choices at the end of every encounter. Overall, being the games defining gimmick, I didn’t find it exactly inspired but still enjoyable. It gave the game an almost Dangan Ronpa-esque feel to it whenever it came time for a judgment. Though an interesting gimmick, the fact that the traitor is chosen at random (except on the first floor during the first playthrough) still means the party will lose a playable character at random. This can be a bit disheartening, considering that every character plays completely different from the other. Still, Lost Dimension does it’s damndest to soften the blow. Even if a character isn’t used in battle, they get about 80% of the battle exp and, when erased, leave behind an equippable item containing their abilities for someone else to enjoy. The equipment also proves useful in unlocking combination abilities that tend to be quite powerful. Still, random is unpredictable, so your favorite character might get “erased” or you might end up with a rather sexist play-through like I did, where the game killed off all of the women to turn it from an ensemble piece to what I pretended was a buddy cop film with way less cops and way more buddies. 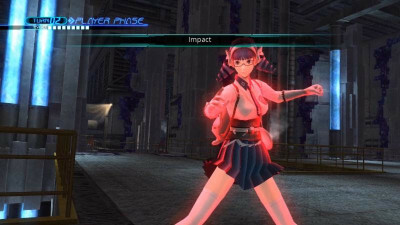 With the Playstation 3 now at the end of its lifespan, I found the graphics in Lost Dimension acceptable for a budget RPG. My only real complaint is that the “budget” part of the game showed during a few of the special attacks, some of them having rather big build-ups only to finish lackluster. The music was a slight step above the graphics with mysterious melodies that complemented the environment and narrative. Overall it is a pretty standard job on both fronts. The same could be said for the Vita version that has an expected reduction in graphical quality and frame rate. Speaking of the Vita, I found the battles in the game to be much shorter than is usual for the genre. Unlike battle-heavy games like Fire Emblem and Project X Zone, the encounters only last for about 15 to 30 minutes, making it perfect for gaming on the go. Adding to that, Lost Dimension is also compatible with PlayStation TV which should make all five of you that bought both systems rather happy. Lost Dimension was enjoyable, even if it was marred by the mid-attack load times and attacks that seemed to reflect the game’s budget price. Overall, it’s a mixture of several fun elements that make it a fun game. 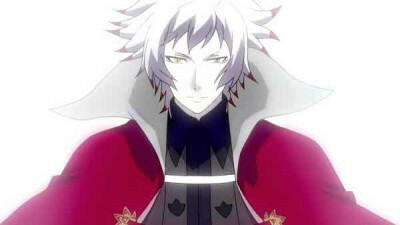 The borrowing it does from games like Dangan Ronpa, Valkyria Chronicles and Persona as well as other media like A Certain Magical Index (To Aru Majutsu no Index), Tokyo ESP and Arkham Horror elevate the game up to a higher bar than one may initially expect. And if you understood all of those references, you should definitely give me your number ‘cause I think we should marry. When not writing reviews as Unnamedhero, Eduardo Luquin can be reached at unnamedheromk13@gmail.com. A reviewable copy of Lost Dimension was provided to Squackle.